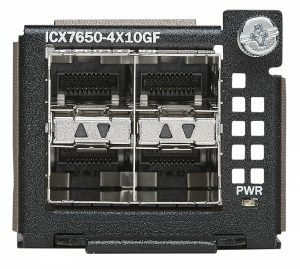 The Ruckus ICX 7650 Switch is designed to meet the new challenges of the multigigabit wireless era. It delivers non-blocking performance, high availability, and scalability with Multigigabit Ethernet access (2.5/5/10GbE), high PoE output with 802.3bt** support as well as 10 Gigabit Ethernet Aggregation and 40/100GbE uplink options. The ICX 7650 is an ideal solution for future proof campus edge deployment as an underlay to support the most demanding next genration wireless infrastructure. Additionally the fiber version of the switch delivers a highly cost effective medium density 1/10GbE aggregation solution with 24 SFP & 24SPF+ ports and 40/100GbE uplinks. 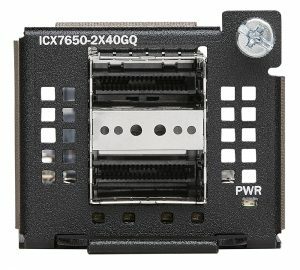 The ICX 7650 supports Ruckus Campus Fabric* as both a Port Extender (PE) and a Control Bridge (CB) delivering unmatched flexibility, scalability and simplified management for campus network deployments.